The tax reform legislation likely to come out of the House and Senate reconciliation process will be far from ideal, but it will be much better than current tax law in several respects (see my last several posts listed in the left-hand margin). One complaint raised by Democrats and others, however, is that the GOP tax compromise will lead to higher budget deficits. Of course they are right, but Democrats fail as legitimate critics given their hypocrisy on the issue of deficit spending. And chronic deficits are ultimately a symptom of government excess. Deficits exist when the polity is unwilling to support the explicit taxes necessary to pay for the spending that politicians are willing and able to authorize. Nevertheless, there is near-universal consensus that the tax plans passed by the House and Senate would add to the deficit if either were to become law, the biggest exception to that consensus being Republican leadership. The Joint Committee on Taxation (JCT) has estimated that the Senate plan would add $1.4 trillion to the deficit without the benefit of economic feedback. That shrinks to about $1 trillion with the dynamic feedback effect of resultant economic growth. Others believe the gap would be smaller, however. The Tax Foundation, for example, estimates the net cost in tax revenue at $500 billion. Veronique de Rugy quotes a dynamic score by Quantria/Inforum that would put the revenue loss at about $300 billion, based on the starting JCT static estimate. The Tax Foundation, as noted by de Rugy, believes the JCT errs in treating the U.S. economy as a closed economy in which business funding is limited to a fixed pool of domestic saving, and in assuming that the Federal Reserve would attempt to offset the economic growth spurred by the tax cuts. 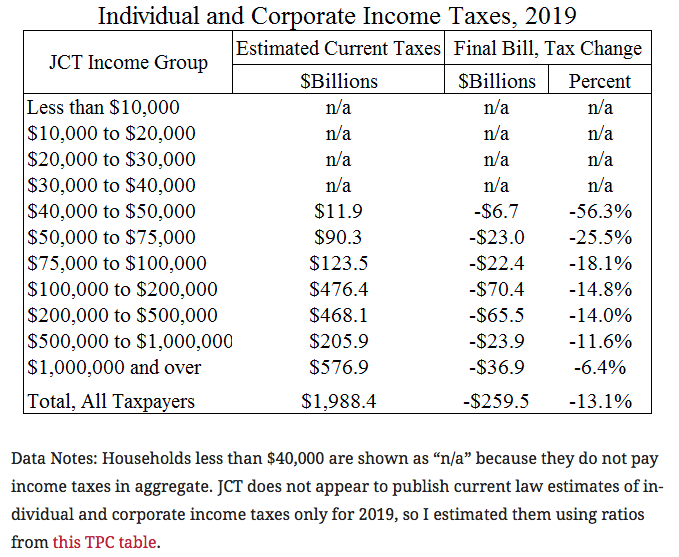 These JCT assumptions mute the economic and revenue responses to tax changes. I will interpret that last remark generously to mean that Tucker would cut spending to shrink deficits, but he also advocates for the sale of federal assets, which I generally support. Concern by some Republicans over the deficit effects of tax reform prompted a debate during the Senate negotiations over a so-called “trigger” that would have increased taxes automatically if revenue fell short of certain benchmarks. At the last link, Ryan Bourne explains what a bad idea that would have been. A future revenue shortfall could be attributed to any number of future developments, not all of which would be compatible with a tax hike as a fix. The trigger would also create uncertainty, dampening the positive revenue effects that would otherwise be operative. It’s a relief that the trigger idea was abandoned by the GOP. Despite the corrosive effects of big government and excessive spending, there is a relatively painless solution to closing the fiscal gap, with or without GOP tax reform. 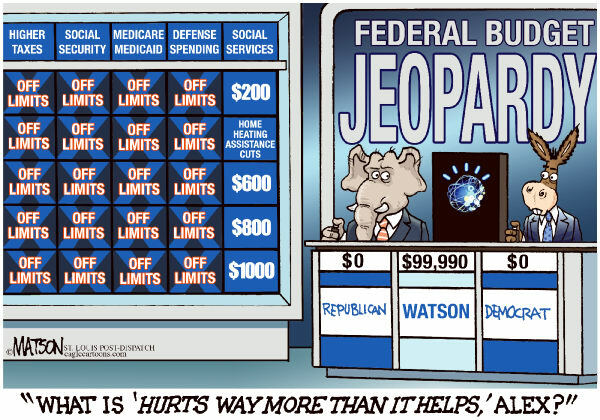 (I use the word “painless” guardedly, because big government inflicts distortions and costs well beyond mere spending levels.) Dan Mitchell has updated his calculations showing that the annual deficit would be eliminated by a decline in the budgeted annual growth of spending from 5.49% to 2.67% over ten years, starting in 2019. That hardly seems draconian, but watch: progressives and even relatively reflective Democrats would call such growth reductions “heartless cuts”. Such is the intellectual integrity of the left.